No matter what your post-graduate plans, goals, or path may be, OSPGD can support you with connections and resources. While your search may begin with an advising appointment with one of our Student Development Advisers, you will most likely use resources such as Handshake (F&M's job, internship, resource, and event database) and our checklist for an effective job search. Further resources are located here. 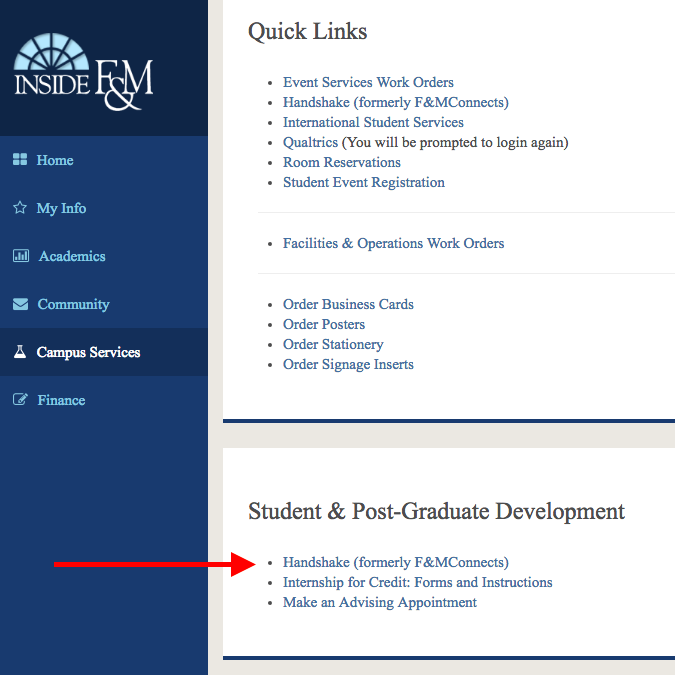 Handshake is F&M's job and internship database, and houses all of OSPGD's resources. Employers in Handshake include local, state and national organizations and companies as well as all F&M on-campus departments/offices. Option 1: Use this link and then your net ID and password to log in. The check list below can help you stay organized no matter what type of opportunity you are seeking. MyVisaJobs Searchable listings of the top employers who sponsor H1B visas — searchable by region, industry, visa status, country of citizenship, and more. International F&M Alumni LinkedIn Group An opportunity to engage with alumni who were once international students, engage in discussions regarding common experiences and best practices for international students, and more. F&M's Office of International Student Services This link leads to the landing page for several webpages of resources and commonly asked questions by F1 international students.